Surfaces still dust-covered five months later! above: even the inclined surface of the high gain antenna seems covered in dust! Cropped from Phys.org's Curiosity says farewell to Mars' Vera Rubin Ridge . Edit: In light (or lack of light in this case) of the current dust storm on Mars discussed in the recent NASA news article Opportunity Hunkers Down During Dust Storm and since almost two years have passed, I've un-accepted @Phiteros' answer to see if there is an update on ExoMARS' dust-on-solar-panels strategy. Since it does not have an RTG, ExoMARS relies on efficient collection of solar radiation for its mission to succeed. I remember reading stories about the Spirit and Opportunity Mars rovers related to solar power and dust - about problems with dust storms, and parking on an incline for the winter in order to collect enough power to 'stay alive'. The Curiosity rover carries a large, powerful RTG for both thermal heat (circulating fluids) and of course electrical power. 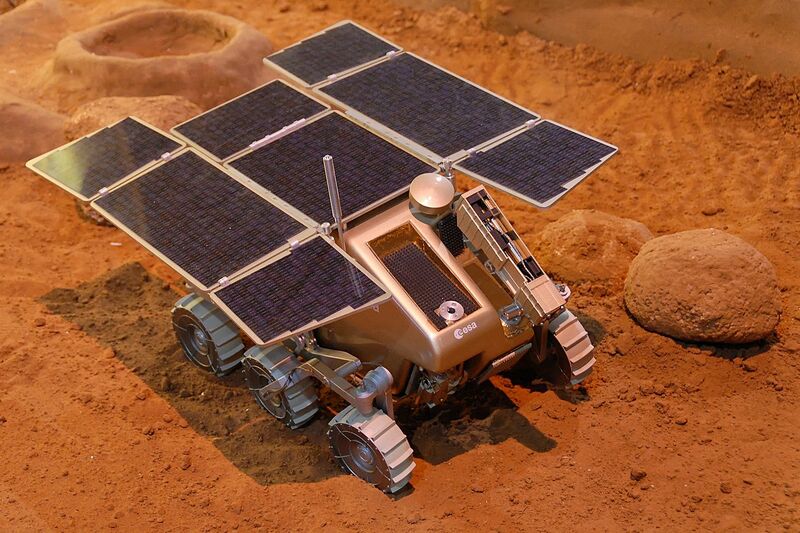 Now it seems the ExoMARS rover will use solar panels again. The do seem a bit larger compared to the size (or volume) of the craft compared to Spirit and Opportunity, but I am wondering, what management techniques are begin considered for the ExoMARS rover to handle covering of the horizontal panels by dust, or low solar elevation in 'winter'? above: "A 1:4 model of the ExoMars rover at the ESA pavilion, 2007 International Paris Air Show at the Le Bourget airport." From here. 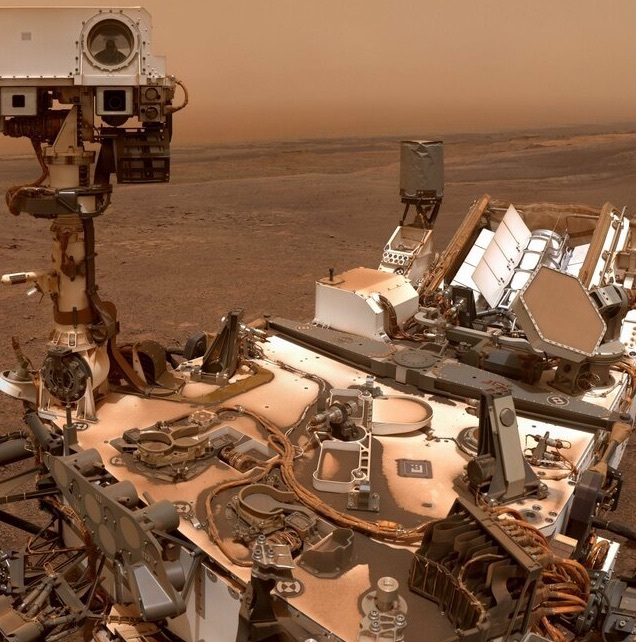 above: "The deck of NASA's Mars Exploration Rover Spirit is so dusty that the rover almost blends into the dusty background in this image assembled from frames taken by the panoramic camera (Pancam) during the period from Spirit's Sol 1,355 through Sol 1,358 (Oct. 26-29, 2007)... Dust on the solar panels reduces the amount of electrical power the rover can generate from sunlight each sol." From here. Spirit and Opportunity were only expected to last 90 days, but when it was discovered that the dust occasionally gets cleared off, the missions became much longer. 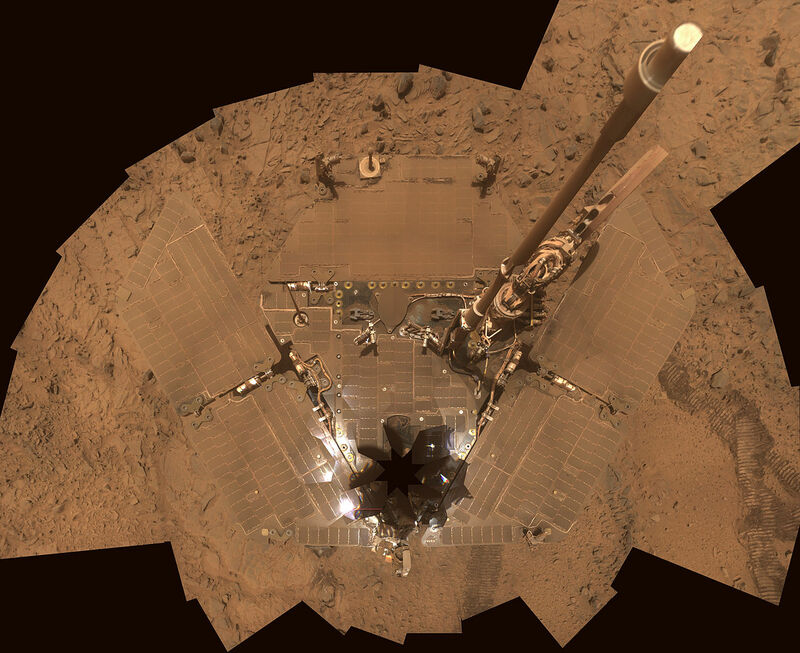 Spirit only stopped when it became stuck in soft sand and could no longer angle its solar panels correctly. Opportunity, on the other hand, is still going, 12 years later. Here is a news article about one of the more recent cleaning events for Opportunity. As far as hibernation during the winter, they will likely follow the same techniques used by Spirit and Opportunity. Unfortunately, I do not know this for sure, but since it worked for MER, they will likely use the same legacy technique. Some of the instruments will also have their own independent batteries, such as the DREAMS experiment, which will operate during the dust storm season. In all likelihood, ExoMars will not have any method to remove the dust. There are several reasons for this. A mechanical device would probably have trouble because of the dust's static charge. Tilting and shaking the rover could work, but it would be complicated and possibly damaging to sensitive instruments. Other methods involve washing them (which requires liquid), using an electrostatic charge (still requires tilting the panels, and could also damage sensitive electronics), and blowing them off (requires moving a high-powered fan across the panels). It was also going to have radioisotope heating units to keep it warm at night so even with no solar power in a dust storm it will still stay warm.
" RHUs have not been adopted, avoiding the technical and organizational complications associated with their use. The inclination angle of the SA can beadjusted to maximize solar power collection for different landing latitudes. This system also provides flexibility while driving on slopes and permits lowering the array in case of dust storm conditions. " Not the answer you're looking for? Browse other questions tagged mars rovers solar-power dust exomars or ask your own question. Could dusters be installed on solar panels on a mars lander? 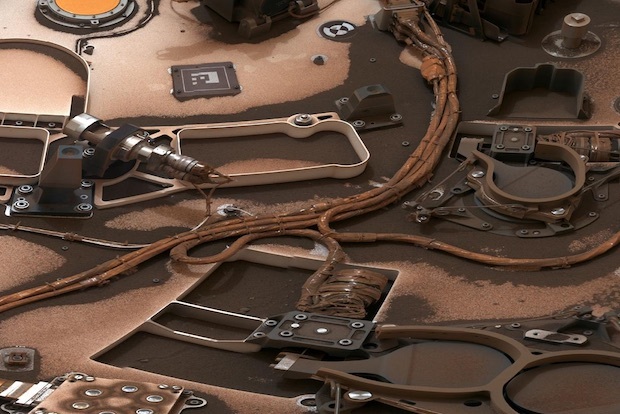 Why is Curiosity remaining on the Vera Rubin Ridge for so long? 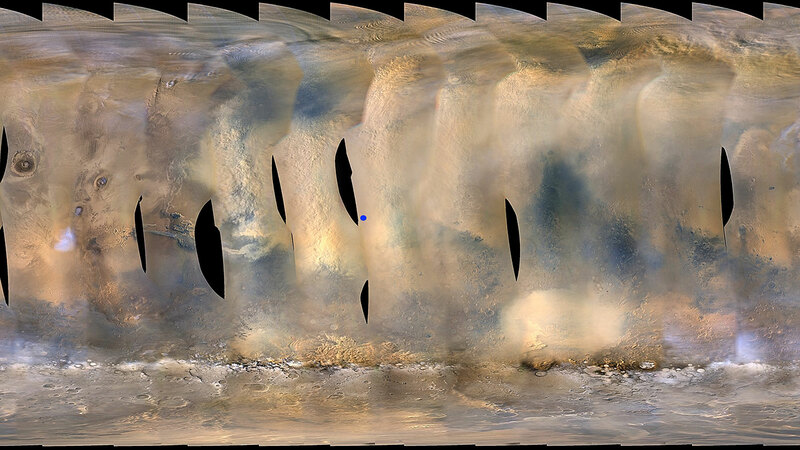 Why are the gaps in MRO global images of mars so irregular and sometimes filled in?